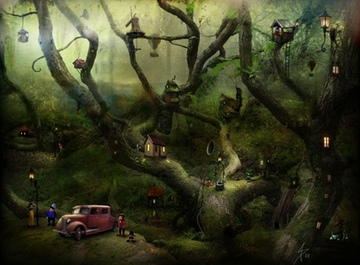 Editor's Note: In addition to kindly allowing us to use A Tree as our Fall Edition graphic, featured artist Alexander Jansson also gave us thoughtful responses to our many questions about the man behind the work. You can click the image to get a larger view, and see more of his work at alexanderjansson.com. Menacing Hedge: When is the earliest time you remember drawing and what did you draw? 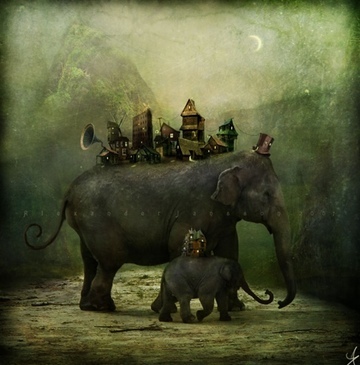 Alexander Jansson: My earliest drawing is depicting a ghost. I believe it's from when I was around 2 years old. Then there was a cowboy period, a pirate period, a punk rocker period. Then I discovered Star Wars, and nothing ever was the same again. MH: Describe the room around you. AJ: It's a quite small room full of organized chaos. I share studio space with my fiancée, and we're both good at collecting things that inspire us. My corner is full of vintage things like cameras, lanterns, hats, and books. Once upon a time, I wanted to have a clean professional looking studio, but it didn't work to create in such a stiff place; now the studio more and more begins to look like something out of one of my images. And I really enjoy it. AJ: I grew up in a small town in the countryside outside of Uppsala in Sweden. I've always been drawing and at age fifteen I started to paint in oil. I never wanted to be a fireman, pilot, or policeman as a kid. I had a period when becoming a chef sounded interesting but over all, an artist, writer or musician was the only profession that seemed fun and developing. For three years, I went to a high school with a focus on traditional art and sculpture. But those years were very basic and I wanted to learn more, to see if this was really for me. In the year 2000, I started the New Domen School of arts in Gothenburg, Sweden; a difficult but much rewarding time. My world got turned upside down. I had to throw away all I knew about art and start over. Very painful, but in the end I came out with a broader view and a great foundation. It needed to be done and was a great way to develop. Sometimes you must kill your darlings. Afterward a couple of friends and I shared a studio and struggled to become traditional artists. At this time, painting and drawing was all I did. No digital, in fact I can say that I almost despised pictures made in a computer. That made it quite contradictive that at the same time I had a huge interest in animated films and especially the modern CGI. I was part of a couple of group shows and exhibited my paintings but received no response whatsoever; all hard work, all hours in front of the canvases, no sells, nothing. I was fed up with the art scene and just needed to do something new, something fresh. I decided to try my luck in the animation world. I attended a three year bachelors degree course in 3D-animation and CGI and that's when things started to happen. I was introduced to the world of digital creation and to my surprise I found out that it was wonderful and I discovered something that to me felt fresh and inspiring. The use of a Wacom tablet also made it much easier to get a hold of this new exciting world. Late evenings and nights were spent experimenting with Photoshop. I used photographs, painted onto them, cut and paste, dodged and burned. It was fantastic. MH: Where do you get your ideas for the characters in your illustrations? AJ: I want them to be very human but without a false filter of happiness and beauty. They may look ugly and like monsters, but that's how it is. We're not perfect. MH: How do you work? AJ: The ideas for my pictures occur when I least expect it. One impression leads to another, think a couple of more steps and hopefully something intriguing starts to form. I start out with a quick and simple sketch to get a hold of the impression and to make it concrete before it disappears into oblivion. I prefer to call my technique "digital mixed media". In a way, it's a kind of collage technique. I take elements from my photographs, 3D models, drawings, and paintings and blend them all in the same picture. I try to work in Photoshop the way I work when I paint traditionally; spontaneous and with intuition. I just let go without caring for the technical boundaries. Over the years I have found my way of working effective and making sure to always have the control over the medium. I still only use the most common and basic features of the digital software. In that way, it reminds me of the traditional way of working, with just a brush, paint and a canvas. The important thing is what is going on in your head. It's all about ideas. Interesting ideas. Some viewers seem to believe that my digital works are traditional paintings. That is not my intention. However, it's very important to give these digital and actually non-existent pictures an organic and living touch. Therefore, I spend much of the production time adding dust, dirt, scratches, wear and brush strokes. It gives the piece character and body. I sense that the common opinion on digital art is that it lacks the true pure touch. And it does. It's hard to get it natural when it actually only exists as 1's and 0's as long as it's in the computer. It's stiff and cold by nature and you have to work hard to make it live. But it's a craftmanship like any other. It's important not to forget about the analog roots. One of my biggest ambitions with my current digital work is to find that perfect balance between analog and digital, to make it feel natural and a genre of its own. I think that I will never go completely digital, doing everything in the computer; if I do, I will probably miss the interesting flow that occurs when I move from analog to digital. The most obvious limitation is the lack of the true traditional touch. You don't "feel" the work the way you do when you paint on, for example, canvas. Sometimes when I've had intense work sessions for days in front of the computer I just have to go mad with a palette knife or my hands and lots of paint on big canvases just to feel and to get some response. Some of those mad sessions later end up as textures in my digital work. MH: The animation preview for your illustrated novel, Ramone Bosco, is simply gorgeous. What can you tell me about animation process and what is the novel about? AJ: The Ramone Bosco project is an ever evolving project. It first started out as a graphic novel where the main idea was to make every frame in my usual visual style instead of the common black and white drawings. It's a huge challenge, but someday I will finish it. At the moment I'm stuck, but I hope to soon get the time to continue. 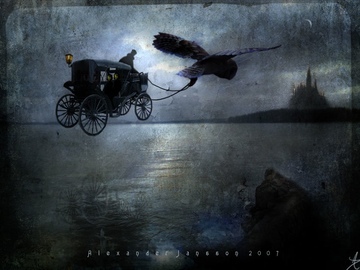 The animation was meant to set the mood for the story and the world. A presentation. I divided my images into different layers and animated them in the software called After Effects. MH: What's more challenging for you: the execution or the idea? AJ: It's always a challenge to come near the idea that's inside your head. Often the original idea turns out to something completely different. AJ: I have some children books ideas that slowly taking shape. I'm also finishing a couple of book cover illustrations and three stories of Anansi the greedy spider for British schools. Here in Sweden, I got the honorable task to design and illustrate the annual Advent calendar for the national radio which is a great tradition in Sweden. A childhood dream come true. MH: Do you have children? If so, how do they influence your work? AJ: I've got two kids, a son and a daughter, and they are a great inspiration. We love to play with Lego, and a strange thing is that ideas for images next to always pops up when building with Lego. We also like to make up stories. Whimsical stories that sometimes turn out to be pictures. AJ: I guess you mean how the natural world affects my work? Some believe that I must have these fabulous dreams at night and that I take much inspiration from them. My answer is dull. I have most common dreams. I never ever dream of the scenarios you find in my work. 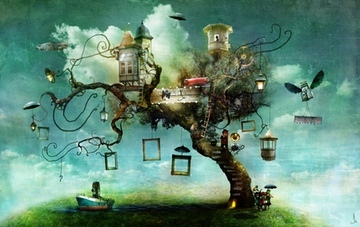 Very often my dreams can be symbolic and mystic but they are always attached to this world and my daily life. So I guess my images are a direct backlash for the limited and rational natural world. It's a longing to something else. MH: What are your favorite movie genres and why? AJ: Some of my all time favourite movies are blockbusters like Star Wars, The Abyss, and Aliens, but nowadays I feel more drawn to the ones that wants to tell it a bit different. Napoleon Dynamite and Gummo and the City of Lost Children are a big inspiration. i also watch a lot of independent animations. There is a whole world out there far from the Pixar stereotypes that really pushes the visuals for the CGI. Very exciting. MH: What is the inspiration behind your auto portraits? AJ: I have always loved to create faces. I don't like portraits though, I never figured out how to get the looks right. But spontaneus, fictional portraits is a completely different thing. The auto portraits started out as far back as 1997. I just wanted to paint faces and soon all these beings started to come up. Every year since then I have some auto portrait periods, it's a great way to get rid of tensions and stress and also good for the inspiration. I have no idea but I believe it's been around 3000 beings totally. AJ: Sometimes I use a notebook or sketchbook, but mostly I try to store the ideas in my head. MH: What role does the artist have in society? AJ: An artist can inspire and wake ideas. That's quite a powerful role when used wisely. AJ: Someone near left me when I was very young. To be abandoned will always be a part of my work. MH: What's your scariest experience? AJ: There are a bunch, actually. One particular funny one is being chased by a mad bull which ended up with me having to jump into a river. Funny afterwards, but traumatizing during. AJ: Early on I used to work at a paper recycle factory. I have also worked at a grocery store. AJ: One girl is planning to tattoo a collage of my motifs on her arm. That's very flattering. AJ: Trends and rules of what is right and what's not can do boring stuff with people. Especially when the honesty in their work disappears. AJ: I like videogames, especially the ones that wants to be different from the mainstream. A dream project would be to create the visual design for an epic adventure game. MH: What's the best piece of advice you've been given?